A lot of people suffer from many different fears, but one of the most common is the fear of the dentist. Having a fear of the dentist can prevent someone from taking care of the much needed dental work they need done. When they delay the dental work, it often leads to a much more serious problem down the road, resulting in a much more painful and expensive experience. At Cosmetic and Family Dentistry of Weatherford, we understand and appreciate your dental fears, and take pride in making sure you have the best experience possible at our office. Dr. Deborah Romack and Dr. Garrett Mulkey offer Nitrous Oxide sedation dentistry to their patients, offering them the much needed relaxation and comfort they need. Nitrous Oxide, also known as laughing gas, is administered through a nasal mask. Not only does Nitrous Oxide relieve you of your pain, but it also relaxes you while our doctors are performing your dental procedure. Dr. Romack and Dr. Mulkey as well as our experienced team members will be present while administering the gas, ensuring you receive just the right amount of gas. When you are relaxed and feel at ease, you are able to get the full experience at our office, letting our experienced team take care of whatever need you may have. 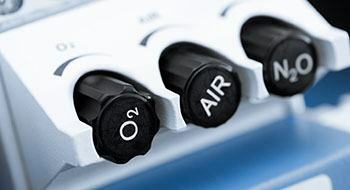 Nitrous Oxide is a conscious form of sedation, so you will be able to respond to the dentist should they need anything. One of the benefits of Nitrous Oxide is the fact that there are no residual side effects. When your dental work is complete and we remove the mask, the effects of the gas go away, giving you the ability to go about your day with no issues or residual grogginess. We understand that your time and money are valuable, which is why we want to be able to give you the most convenient and considerate approach to your dental woes. Everyone at Cosmetic and Family Dentistry of Weatherford believes in not only providing the best dental care possible, but also making sure that our care is accessible to as many people as possible. Another benefit to Nitrous Oxide sedation dentistry is the fact your entire body benefits to its effects. When your body is relaxed and your mind is at ease, it makes the healing time of your dental work much shorter. Your body heals itself naturally, but when stress and anxiety are in the picture, it prevents the body from doing what it does best. The feelings of calm and comfort expedite the healing process, making your healing time quicker and more efficient. Come in to our Weatherford office, conveniently located near Aledo, and experience the benefits of Nitrous Oxide sedation dentistry for yourself. We will be more than happy to discuss and assist you with whatever needs you may have. We look forward to helping you have the best experience possible at our office and make your fear of the dentist a thing of the past.